The family of Fragile X Mental Retardation Proteins is composed of three members: Fragile Mental Retardation 1, Fragile X Related 1 and X Related 2 proteins. These proteins are associated with mRNPs within translating ribosomes and have the capacity to shuttle between the nucleus and the cytoplasm. Great attention has been given to FMRP due to its implication in human hereditary mental retardation while FXR1P and FXR2P have only recently been studied. Using antibodies directed against several epitopes of FXR1P, we have detected protein isoforms generated by small peptides pocket inserts. Four isoforms of MW 70, 74, 78, 80 kDa are widely distributed in mouse organs, while in striated muscles these isoforms are replaced by proteins of 82 and 84 kDa containing an extra pocket of 27 aa. Expression of these muscle isoforms is an early event during in vitro differentiation of myoblasts into myotubes and correlates with the activation of muscle-specific genes. However, while FXR1P82,84 are associated with cytoplasmic mRNPs in myotubes, they are sequestered in the nuclei of undifferentiated myoblasts. These observations suggest that, in addition to a cytoplasmic function yet to be defined, FXR1P82,84 may play a nuclear role in pre-mRNA metabolism. 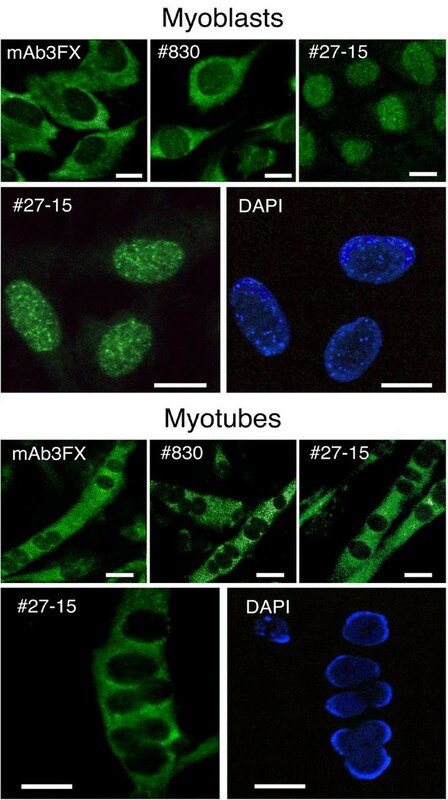 The pattern of subcellular partitioning of FXR1P isoforms during myogenesis is unique among the family of the FXR proteins. The model system described here should be considered as a powerful tool for ongoing attempts to unravel structure-function relationships of the different FMR family members since the potential role(s) of FXR1P as a compensatory factor in Fragile X syndrome is still elusive. The Fragile X Mental Retardation (FMR) protein family is composed of three highly homologous members. The Fragile X Mental Retardation Protein (FMRP) is coded by the X-linked FMR1 gene and its absence is directly associated with human hereditary mental retardation [reviewed in 1,2]. Two other members of this family are the Fragile X Related 1 (FXR1P) and Fragile X Related 2 (FXR2P) proteins [3,4,5] that are coded by the FXR1 and FXR2 genes located at 3q28 and 17p13.1, respectively, in human. These genes are highly conserved in vertebrate evolution and contain two KH domains and a RGG box that are functional characteristic motifs in RNA-binding proteins [4,5,6,7]. In addition, they also contain a nuclear localization signal (NLS) as well as a nuclear export signal (NES) making them putative nucleocytoplasmic shuttling proteins [reviewed in 1,2]. Finally, FMRP as well as the other members of the family have been shown to be associated with messenger RiboNucleoParticles (mRNP) within actively translating ribosomes. This association suggests that their roles might be linked to RNA transport and/or translation [8,9,10,11,12]. Whereas absence of FMRP is the cause of Fragile X Mental Retardation in human, it is not known whether FXR1P and FXR2P are associated to any pathology or phenotype. Also it is not known whether these homologous proteins can compensate for the absence of FMRP in the case of the Fragile X syndrome. In vitro studies showed that all three members interact with themselves and with each other [5, 13, 14]. However, their distribution in certain mouse and human tissues showed individual pattern of expression [15, 16] indicating that each protein also may function autonomously . FXR1P has been shown to have a complex expression pattern in different mammalian cell lines since six distinct isoforms were observed and their respective levels were shown to be cell type specific . In particular, it was observed that 4 distinct FXR1P isoforms of MW 70 and 74 kDa (previously referred to as short) and 78 and 80 kDa (long) are widely expressed in diverse cell lines as well as in different organs in mouse. However, in muscle, these isoforms are replaced by novel super long isoforms of MW 82 and 84 kDa. The replacement of the short and long isoforms by the super long isoforms is clearly apparent during myogenesis of myoblastic cell lines that can differentiate in vitro into myotubes. This model system which mimics, although imperfectly, muscle differentiation has permitted us to show in the present report that transition of the short and long isoforms to the super long is an early event that takes place concomitantly to the expression of muscle-specific genes. In addition, we also show that low levels of the super long isoforms are constitutively expressed in undifferentiated myoblasts and that they are sequestered in the nuclei, while in differentiated myotubes P82,84 are transferred to the cytoplasm where they are incorporated in mRNPs present in actively translating ribosomes. 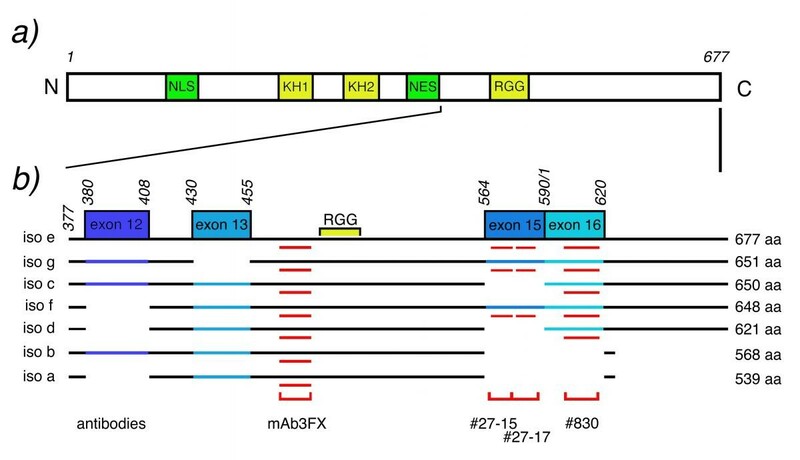 Initial reports of FXR1 cloning described the presence of two mRNA variants [3,4] while recent analyses showed that at least 7 mRNA variants can be detected . These alternatively spliced mRNA differ each from other by the presence or absence of four different exon sequences. A virtual representation of the corresponding deduced protein isoforms is shown in Figure 1. For the identification of the different proteins corresponding to the different mRNA variants (iso a to iso g) we used the numbering of Kirkpatrick et al. . For convenience, the different proteins are illustrated in order of decreasing length. All of the seven FXR1P isoforms contain the same unmodified region from amino acids 1 to 379 after which the addition or lack of different small peptide pocket inserts are due to alternative spliced mRNA variants. Addition of 87, 78 and 81 nucleotides inserts in different mRNA directs the synthesis of 29, 26, and 27 extra amino acid pockets, (exon 12, 13 and 15 boxes in Figure 1b) respectively. A fourth spliced variant of 92 nucleotides induces a frameshift that results in the addition of 30 amino acids and a C-terminal with a final product of 677 amino acid long protein. When the 92 nucleotides sequence is absent, a stop codon at bases 1878-1880 of the mRNA allows the synthesis of only 5 additional amino acids and the C-terminal is thus truncated (Figure 1b). Schematic representation of the FXR1 protein structure. a) Localization of the RNA-binding domains (KH and RGG; yellow) and the nuclear localization (NL) and export (NE) signals (green). b) Structure of the different FXR1P isoforms at the C-termini generated by the four small peptide inserts (in blue) deduced from the sequence of individual mRNA variants according to Kirkpatrick's et al. numbering and after compilation of GenPept access No AF124386.1 to 124394.1. The boxes (exon 12, 13, 15 and 16, in blue) correspond to the peptide inserts present or absent in the different protein isoforms. The red zones indicate the regions recognized by the different antibodies. We have previously described two antibodies, mAb3FX and rabbit polyclonal serum #830, that detect different FXR1P isoforms . To obtain new antibodies to the muscle specific isoforms, two synthetic polypeptides corresponding to stretches in the 27 aa sequence present in the muscle super long FXR1P isoforms [12,18] were used to immunize rabbits. Two polyclonal sera #27-15 and #27-17 were obtained. The different regions that are recognized by the antibodies are shown in Figure 1b. In theory, mAb3FX should have reacted with the 7 isoforms, however because of the differences of 1 to 3 amino acids between iso c, iso f and iso g (650, 648 and 651 aa) it was not possible to resolve these proteins by SDS-PAGE. The specificity of the antibodies to the different FXR1P isoforms as well as the distribution of the different isoforms in several mouse tissues is shown in Figure 2. A complex distribution of the 70, 74, 78, and 80 kDa isoforms is observed using mAb3FX. In agreement with previous observations  none of these isoforms are detected in muscle and heart extracts. Instead, super long isoforms of 82 and 84 kDa are present in these tissues. These observations were clearly confirmed with the use of anti-serum #830 which detects the 78, 80, 82 and 84 kDa isoforms and also with #27-15 and #27-17 sera that are specific to the 82 and 84 kDa isoforms. The additionnal band detected at 94 kDa with mAb3FX corresponds to the closely homologous Fragile X Related 2 protein  recognized by this monoclonal antibody since part of the peptide used for immunization is present in FXR2P. Distribution of FXR1P isoforms in extracts from different tissues and organs in adult mouse. Equal amounts of proteins (60 μg) were resolved by SDS-PAGE (7.5% acrylamide) and immunoblotted with three antibodies detecting different epitopes in FXR1P (see Results section). Note the specificity of #27-15 antiserum to the FXR1P82,84 isoforms and the cross-reaction of mAb3FX with FXR2P (94 kDa). 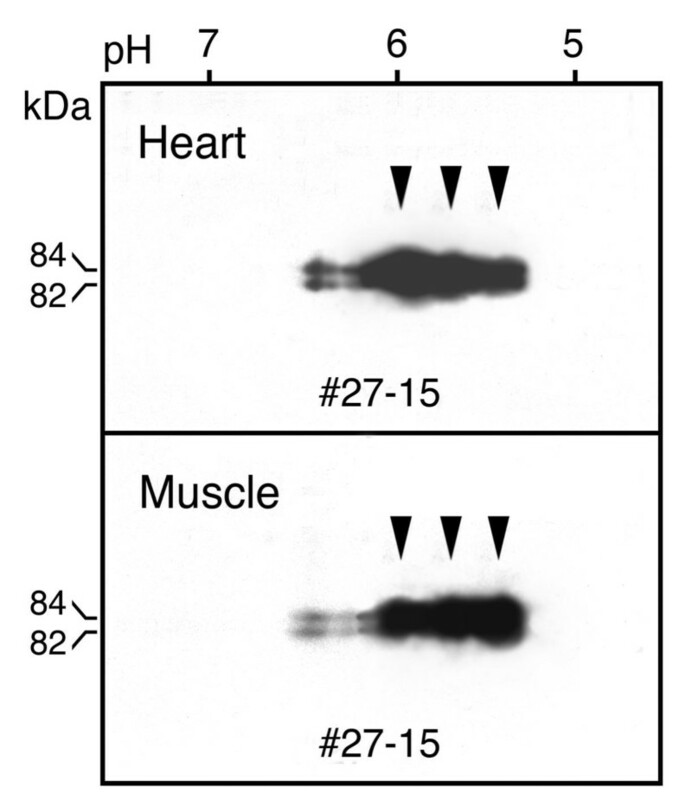 To compare P82,84 in heart and muscle, protein extracts prepared from these tissues were subjected to two-dimension gel electrophoresis followed by immunoblot analyses using #27-15 antiserum. P82,84 appear to undergo major post-translational modifications and three variants with pI 6.0, 5.7 and 5.4 were detected for each protein in both tissues, however with slight different distributions. Additional minor forms were also detected around pI 6.6 (Figure 3). These results strongly suggest that in these two tissues P82,84 have identical distribution. Indeed, in situ immunostaining of FXR1P in longitudinal sections from adult mouse limb muscle and heart with #27-15 (or #27-17) showed punctuated immunoreactive sites associated mainly with the myocontractile structures (Figure 4). 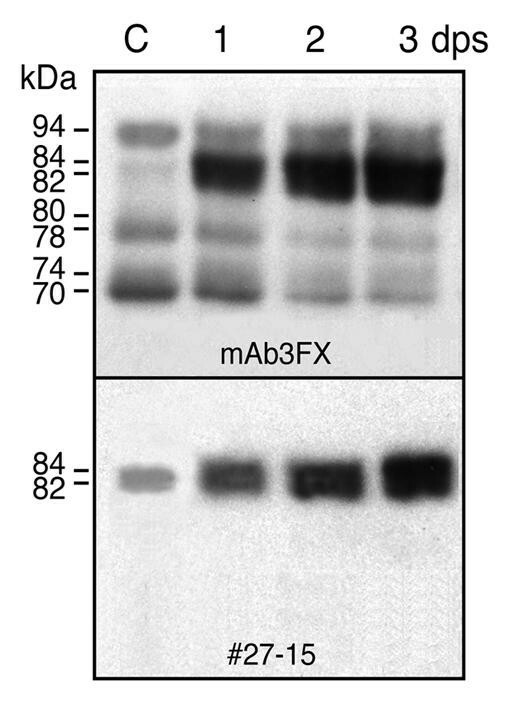 Identical staining patterns were obtained with mAb3FX and #830 as previously shown  since these antibodies also detect P82,84 while the other FXR1P isoforms are absent in these tissues. Similar if not identical pictures for mouse muscle were also reported recently  with the use of a different antibody (Ab2107). The distribution and specific punctuated features of P82,84 staining in striated muscles are reminiscent of that seen for costameres structures containing RNA and protein [19,20]. These structures lie between the cell membrane and the Z line in skeletal and cardiac muscles . Two-dimensional immunoblot analysis of proteins extracted from heart and limb muscle from adult mouse. Hundred and fifty μg of protein extracts were resolved by IEF in the first dimension and by 7.5% SDS-PAGE in the second dimension. Arrows indicate the positions of the major P82,84 modified variants at pH 6.0, 5.7 and 5.4. Comparative immunostaining of FXR1P82,84 in mouse heart and limb muscle. The red staining deposits indicate the localization of P82,84 in striated muscle as dot-like structures reminiscent of costameres associated with Z bands. Nuclei were counterstained with hematoxylin. Scale bars: = 10 μm. We have shown previously that the replacement of P70-80 by P82,84 correlates with differentiation of C2C4 myoblasts into myotubes after serum removal . This mouse myogenic cell line is derived from the original skeletal muscle cell line C2 and is considered permissive since it can readily differentiate in myotubes in medium containing low serum concentrations . To establish more precisely the timing of the replacement of the short and long isoforms by the super long, proteins were prepared at different times after serum starvation and analyzed by immunoblotting. The kinetics of expression of the different FXR1P isoforms is presented in Figure 5. 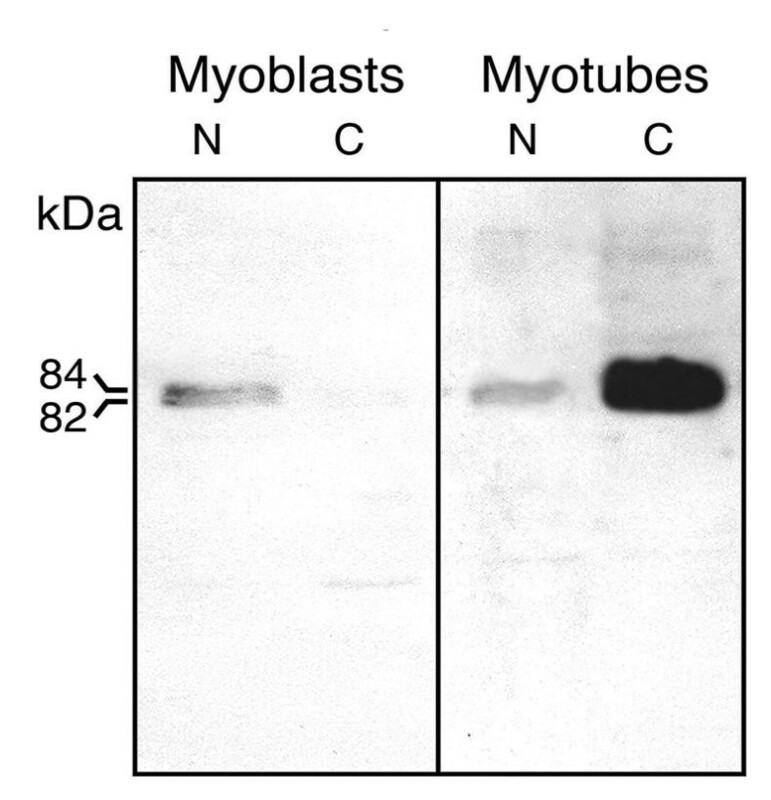 In non-differentiated myoblasts prominent bands were observed at 70,74,78 and 80 kDa as well as the 94 kDa FXR2P. As early as 24 h after induction, high levels of P82,84 were detected while levels of the other FXR1P isoforms started to decline. By three days after serum deprivation, P82,84 levels reached a maximum plateau and only faint bands corresponding to the other isoforms were detected. A better picture was obtained using anti-serum #27-15 specific to the super long isoforms and unexpectedly allowed us to detect low levels of P82,84 in non-differentiated myoblasts. The results presented above clearly showed that increased accumulation of P82,84 has taken place during the first 24 h after serum starvation at a time when no morphological changes are detected at the microscopic level. To test for the hypothesis that the induction of P82,84 is an early event that is directly linked to the initial commitment of myoblasts to differentiate into myotubes, protein extracts were prepared at different times over a period of 24 h after serum depletion. Immunoblot analyses showed that trace amounts of P82,84 were present in undifferentiated myoblasts. Increasing levels of P82,84 were detected as early as 12-15 h (Figure 6 upper panels). At this time, accumulation of muscle specific factors of the regulatory program that controls myogenesis, such as myogenin, began to increase . Cardiac Troponin T levels also began to increase around 12 h while a decrease in nestin levels was observed in agreement with earlier observations made on different cell lines induced to differentiate into myotubes [24,25]. Finally, desmin levels remained constant during the early period studied (not shown), since its accumulation is a late event during myogenesis . Time course analyses of FXR1P isoforms levels in C2C4 cells induced to differentiate. Equal amounts of proteins (approximately 40 μg) from unstimulated myoblast (C: control) and stimulated cells 1 to 3 days after serum deprivation were separated by SDS-PAGE and processed for immunoblot analyses. All FXR1P isoforms were revealed with mAb3FX while P82,84 were detected with #27-15. dps: days post-stimulation. Accumulation of FXR1P82,84 is an early event and coincides with expression of different myogenetic markers. Protein (40 μg) and RNA (5 μg) were prepared at the indicated times and subjected to immunoblot (Western) and Northern analyses, respectively. Exposure times for Western analyses were between 15 and 30 sec. Northern blots were exposed for 36 h while the 81 bp insert required prolonged exposure up to 72 h due to the short probe used. hps: hours post-stimulation after serum deprivation. Based on the observations reported above, we tested whether accumulation of P82,84 was regulated at the level of its mRNA. Total RNA was extracted from undifferentiated and from stimulated C2C4 myoblasts at different times and subjected to Northern blot analyses. Membranes were sequentially probed with 32P-labeled exon 15 and various cDNA inserts. The results presented in Figure 6 (lower panels) representative of three independent time-course analyses, showed that muscle specific exon 15 (81 nucleotides) hybridized to the two FXR1 transcripts of 3.2 and 2.4 kb [10,18]. In agreement with the results obtained at the protein level, these mRNA variants are present at low levels in non-differentiated myoblasts. Densitometric analysis showed a clear and significant increase (3.0 ± 0.5) of both transcripts at 15 h after serum deprivation, then after their steady state levels continued to augment to reach a 5 fold increase by 24 h. The beginning of this increase coincided in time with that of myogenin and cardiac actin mRNAs, which began to accumulate at 12-15 h. In contrast, myf 5 mRNA levels decreased gradually as expected . These results clearly indicate that accumulation of the FXR1 mRNA variants containing the muscle-specific exon 15 tightly correlates with the activation of muscle-specific genes. Given the association of FXR1P with mRNPs present in polyribosomes , we asked whether all the different FXR1P isoforms would be found present in mRNP engaged in the translational machinery. Post-nuclear supernatants were prepared from non-induced myoblasts as well as from myotubes at day 3 after serum deprivation and analyzed by sedimentation velocity through sucrose density gradients. Immunoblot analyses of each collected fraction using the different antibodies to FXR1P showed that in extracts from non-induced cells, FXR1P70,74,78,80 co-fractionated with light polyribosomes, while in extracts prepared from myotubes, P70,74,78,80 and P82,84 were detected in heavier sedimenting structures (Figure 7). Further evidence that the FXR1P82,84 isoforms were associated with mRNP engaged in polyribosomes was obtained after treatment of these structures with EDTA that causes dissociation of ribosomes into their large and small subunits and the release of the associated mRNPs. After such a treatment, P82,84 were recovered as heterogeneous slower sedimenting structures with the majority peaking around 60-70 S (Figure 7). These results indicate that similarly to their closely related homologues FMRP and FXR2P, all FXR1P members are also associated with mRNPs within the translational machinery. FXR1P isoforms are associated with mRNPs present in polyribosomes. Aliquots containing ~12 A260 units of post-nuclear supernatants from non-induced myoblasts and from differentiated myotubes at day 3 were analyzed by sedimentation velocity through sucrose density gradients. Each collected fraction from gradients containing MgCl2 or EDTA (lower panels) was analyzed for the presence of all FXR1P isoforms using three different antibodies. Note that none of the antibodies used detect P82,84 in cytoplasmic extracts from myoblasts. 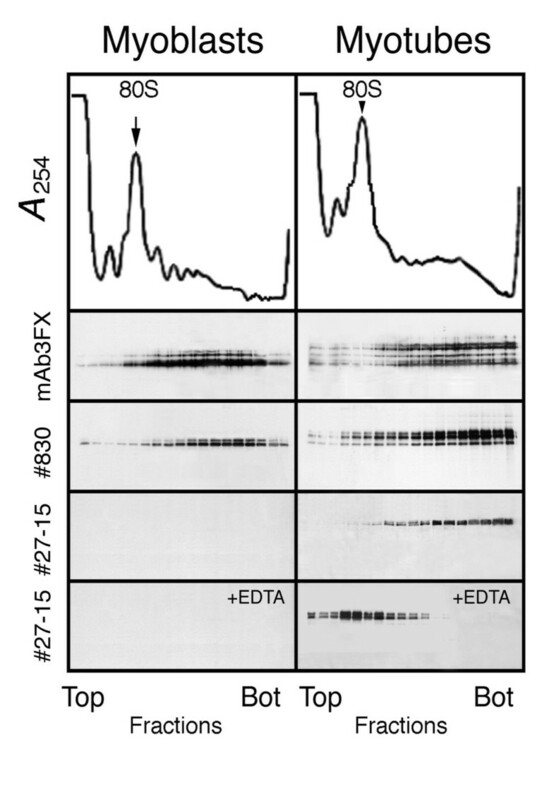 In repeated analyses using the highly specific antibodies #27-15 and #27-17, we were unable to detect P82,84 in polyribosomes and in mRNPs extracted from myoblasts (Figure 7). This was puzzling since these isoforms were constantly detected in total protein extracts (see Figures 5 and 6) and we hypothesized that P82,84 would have been retained in the 10 000 x g pellet during the preparation of the cytoplasmic extracts. Indeed, crude preparations of nuclear and cytoplasmic fractions from myoblasts showed that P82,84 were recovered associated with the nuclear fraction while no signals were detected in the cytoplasm (Figure 8). In contrast, we estimated that approximately 95% of P82,84 were present in the cytoplasmic fraction in myotubes, while the remaining 5% were observed associated with the nuclear fractions. Since the intensities observed in both nuclear preparations of myoblasts and myotubes were similar, these results indicate that equivalent amounts of FXR1P82,84 are present in nuclei regardless of the differentiation stage of the cells. Low levels of FXR1P82,84 are present in nuclear preparation of undifferentiated myoblasts and differentiated myotubes, while in differentiated myotubes, accumulation of P82,84 is restricted to the cytoplasmic fraction. N: nuclear, and C: cytoplasmic fractions, respectively. The results reported above clearly showed that the low levels of FXR1P82,84 isoforms present in myoblasts are not associated with polyribosomes and are recovered in the nuclear pellet after cell lysis. These observations prompted us to determine the in situ localization of P82,84 in differentiated and undifferentiated C2C4 cells. Immunofluorescent studies were performed using the different antibodies to FXR1P. In myoblasts, a clear cytoplasmic staining was observed for P70,74,78,80 and for P78,80 using mAb3FX and #830, respectively (Figure 9). Very faint signals were also observed at the level of nuclei, and were confirmed to be intranuclear by confocal microscopy (Figure 9 upper panels). Since P82,84 represent a very minor fraction of total FXR1P in myoblasts (see Figures 5 and 8) it was not possible to distinct these isoforms with mAb3FX or #830 by immunofluorescent reaction due to the strong cytoplasmic staining of the other FXR1P isoforms. However, when antibody #27-15 was used, a granular pattern of nucleoplasmic distribution of P82,84 was observed as dot-like structures, which in some instances corresponded to DAPI stained dots (Figure 9). It should be noted that prolonged exposure times were required to capture the intranuclear images of P82,84. In cultures maintained in low serum for 3 days, typical fused myotubes were observed as elongated syncytia containing multiple nuclei and a strong cytoplasmic staining of all isoforms including P82,84 was observed in agreement with the results obtained at the level of polyribosomes analyses (see Figure 7). Intracellular localization of the short, long and super long FXR1P isoforms by indirect immunofluorescence in myoblasts and myotubes as detected with the different antibodies to FXR1P. Confocal (upper panels) and light (lower panels) microscopy analyses after reaction with the different anti-FXR1P antibodies. Nuclei were counterstained with DAPI. Scale bars: = 5 μm. Fragile X Related 1 protein belongs to the FMR family of RNA binding proteins which are specifically associated with mRNPs engaged in actively translating ribosomes. All members of this family share the same protein structure and contain key domains that are conserved in RNA binding proteins [reviewed in 27] as well as NL and NE signals which allow the proteins to shuttle between the cytoplasm and the nucleus [8,28,29,30]. Indeed, accumulation of the FMR proteins in the nucleus has been observed experimentaly with truncated variants of the proteins [28,30] as well as after overexpression experiments followed by treatment with Leptomycin B, an antibiotic that inhibits the nuclear export of NES-containing proteins [31,32]. Due to extensive alternative splicing of the FMRP primary transcript [33,34], it is believe that at least 20 different FMRP isoforms might exist. However, using the available antibodies, only 6 FMRP variants have been observed [35,36,37]. Similarly to FMR1, FXR1 primary transcript undergoes complex alternative splicing, however yielding in theory a much more modest number of protein isoforms. Recent studies  showed that 7 mRNA variants are detected, and our analyses in mouse organs revealed that unlike FMRP, the different FXR1P isoforms are tissue-specific. In general, P70,74,78,80 are widely expressed, albeit at different levels, and their respective ratio seem to be cell and tissue specific. In heart and skeletal muscle, these short and long protein isoforms are absent and are replaced by the P82,84 super long isoforms that are generated by a small peptide insert of 27 aa . 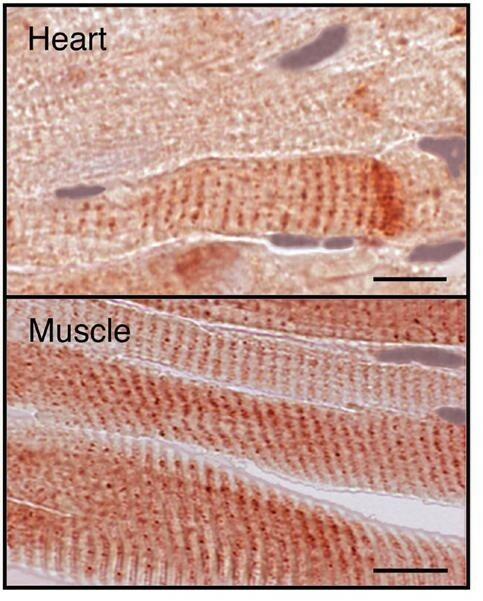 While FMRP is abundant in neurons, it is absent in muscle [12,35]. On the other hand, FXR1P82,84 specific to muscle has not been detected in neurons or in brain extracts [12 and this study]. This tissue specificity is not maintained in culture of undifferentiated myoblasts since both FMRP and P82,84 are detected in these cells . In addition, P70,74,78,80 isoforms which are absent in muscle are clearly present in myoblasts. These observations suggest that the individual FMR members may be interchangeable in certain physiological conditions such as cell deadaptation in culture  or under cellular reprogramming during wound healing . Using the model system of myoblast induced to differentiate into myotubes, we provide evidence that expression of the non-muscle to muscle-specific isoforms of FXR1P correlates with cellular differentiation. We observed that the levels of P82,84 and that of muscle mRNA variants begin to increase at an early time after stimulation concomitant with the expression of different markers of myogenesis. Accumulation of these super long isoforms is paralleled by the decrease of the short and long isoforms and finally at day 3 when approximately 80% of the cells underwent myotube differentiation, P82,84 accounted for the great majority of FXR1P. These results strongly suggest that the mechanisms by which FXR1P82,84 expression are controlled, reside at the level of splicing of the primary transcript. Further analyses are required to determine the factors associated with the expression of these muscle mRNA variants. In undifferentiated myoblasts, P82,84 make exception in the FMR protein family since they are not associated with polysomal mRNPs and are sequestered in the nucleus. One possible explanation for this localization would have been that these isoforms contain, in addition to the canonical NLS found in all FMR protein members, a second nuclear localization signal. In fact, Tamanini et al. recently reported that the 27 aa pocket insert contains a short arginine rich motif (QRRNRSRRR) identical to amino acids 35 to 44 present in a domain that confers nucleolar localization to the HIV Rev protein . Although a similar (PQRRNRSRRRRFRGQ) peptide present in the 27 aa pocket, when coupled to a dye, has been shown to penetrate the cell and target the nucleolus , transient expression of all FXR1P isoforms, with or without the 27 aa pocket, localize exclusively to the cytoplasm [39 and our unpublished results]. Thus, it is not established that localization of FXRP82,84 is under the control of this peptide sequence. On the other hand, proteins that have been considered to be strictly nucleoplasmic, such as the hnRNPs  or the Rev proteins , have subsequently been found to shuttle between the nucleus and the cytoplasm [42,43,44,45]. In addition, hnRNPs have been shown to participate in the processing of pre-mRNAs and in the transport of mRNAs to the cytoplasm, and have even been suggested to play a role in translational regulation [46,47,48]. We propose that FXR1P82,84 might be sequestered in nucleoplasmic complexes in undifferentiated myoblasts and once cells are committed to differentiate, P82,84 are transferred to the cytoplasm with mRNPs carrying the newly processed mRNAs specific to the differentiated stage of myotubes. According to our working hypothesis, a nuclear role, yet to be defined, for FXR1P82,84 in undifferentiated myoblasts, is conceivable. Previous studies on the FMR proteins have shown that although the FXR1 protein is predominantly cytoplasmic, in rare occasions a nuclear localization has been observed in undifferentiated cells in several tissues of human foetuses and mouse embryo [15,49]. The model system of C2C4 myoblasts that can be manipulated in vitro to differentiate into myotubes provides strong evidence that specific isoforms of FXR1P are indeed sequestred in the nucleus in undifferentiated myoblasts. As a working hypothesis we propose that the pattern of nucleo-cytoplasmic partitioning of FXR1P isoforms is under the control of factors regulating cell differentiation. By extention, we also speculate that isoforms of FMRP, that for the moment have escaped detection due to the very restricted number of available antibodies, might play a nuclear role in mRNA maturation at specific stages of neuronal differentiation and plasticity. In conclusion, the model system described here should be considered as a powerful tool for ongoing attempts to unravel structure-function relationships of the different FMR family members since the potential role(s) of FXR1P and FXR2P as a compensatory factor(s) in Fragile X Mental Retardation is still elusive. The mouse myogenic cell line C2C4, a subclone of the mouse skeletal muscle cell line C2,  was obtained from Chistian Pinset, Institut Pasteur, Paris, France. Cultures were routinely maintained at low cell density in Dulbecco's modified Eagle's medium (DMEM) supplemented with 20% fetal calf serum (FCS) plus antibiotics (100 units/ml penicillin, 50 μg/ml streptomycin). Cultures were usually initiated with 3 × 104 cells in 100-mm diameter petri dishes. After 4 days of culture, differentiation was induced by replacing the medium with DMEM containing 0.2% FCS. Two synthetic polypeptides of 15 (DDSEKKPQRRNRSRR) and 17 (NRSRRRRFRGQAEDRQP) amino acids present in the muscle peptide insert of 27 aa  were synthesized on a branched lysine residue (MAP carrier core technique by Research Genetic, Huntsville, Alabama) and used for immunization of rabbits using standard protocols and two polyclonal sera #27-15 and #27-17 were obtained. The monoclonal antibody 3FX and the polyclonal #830 anti-serum that detect different epitopes, have been described previously . Total proteins from cell cultures and from various mouse tissues were prepared as described . Immunodetection analyses were performed using the following antibodies: mAb3FX and #830 , #27-15 and #27-17 (this study) for FXR1P. Hybridoma supernatants for cardiac troponin T (CT3; developed by JJ-C Lin), myogenin (F5D; WE Wright), nestin (Rat-401; S Hockfield), and desmin (D3; DA Fischman) were obtained from the Developmental Studies Hybridoma Bank developed under the auspices of the NICHD and maintained by The University of Iowa, Department of Biological Sciences, Iowa City, IA 52242 (http://www.uiowa.edu/~dshbwww/). Immunoreaction was detected using horse radish peroxidase-conjugated secondary antibodies followed by the ECL (Amersham Pharmacia Biotech) reaction and exposure to Kodak Biomax MR films. High resolution two-dimension gel electrophoresis was conducted essentially as described  with the following modifications. The first IEF dimension contained 9 M urea, 2% Ampholynes pH 3.5-10 (Amersham Pharmacia Biotech AB) and 2% of CHAPS (Sigma, St Louis, MO) instead of 2% NP-40, and electrophoresis was conducted for 14 000 V/h under a constant current of 300 V. The second SDS-PAGE dimension consisted of a 7.5% acrylamide gel. Distribution of the different FXR1P isoforms in nuclear, cytoplasmic and polyribosome fractions were conducted as described previously  in the presence of Complete™, Mini (Roche Diagnostics) protease inhibitors cocktail. Total RNA was prepared using the Trizol reagent (GIBCO). Northern blot analyses were performed as described . RNA was estimated by optical density at 260 nm and corrected for even loading (5 μg) after dot blot hybridization with a 32P-labeled 18S rRNA probe followed by radioactivity determination by liquid scintillation counting. cDNA inserts for myogenin, myf5 , and cardiac actin  were 32P-labeled by random priming. To obtain a specific probe to FXR1 exon 15, the 81 bp was cloned in pCR®II plasmid and amplified by PCR using as primers CAGGAAACAGCTATGACC (forward) and ATACGACTCACTATAGGG (reverse). The short 297 bp fragment obtained was labeled by random priming. Densitometric analyses were performed on autoradiograms using the NIH Image 1.62f program. Immunoreactions on cells grown on glass coverslips and on sections from mouse organs were performed as previously described . Fluorescent and light microscopy were viewed with a Nikon TE300 microscope connected to a CoolSnap camera (RS Photometrics) using a 100 x oil immersion objective. Confocal images were obtained with a Zeiss LSM-310 microscope and images were colored using the Adobe PhotoShop program. We thank Sylvie Giroux and Michel Vincent for helpful discussions, Michael Rudnicky, and Christian Pinset for cDNA probes and cell lines, Sandra Tremblay for technical assistance and Yves Labelle for critical reading of the manuscript. This work was supported by the Natural Sciences and Engineering Research Council of Canada. M.D. was supported by a studentship from le Fonds pour la Formation des Chercheurs et l'Aide à la Recherche du Québec.